High performers. These men and women are the elite shock troops of any organization. Few and far between, highly prized, and at times difficult to manage, studies have shown that high performers on average perform up to 400% more than the average employee in companies they work in. Positive: Most high performers I’ve worked with tend to have a positive, can do attitude. They believe that through hard work, focus and persistence there is little they can’t accomplish. This view not only helps them power through tough situations but also inspires people to rally around them to support on them on their quests. Get Stuff Done: Pardon my French. These folks are incredibly achievement oriented. They live to accomplish things and want to prove to themselves and to others that they can accomplish the most challenging tasks and projects. The longer the task list, the happier they are (which can present other problems). Are self driven: The drive to accomplish and get things down comes from deep down with these people. It’s a like a roaring fire that simply consumes everything in its path. You don’t need to encourage them. They have their own agenda and are out to prove to themselves and others that they can and will deliver. Are work horses: Some high performers ability to get stuff done is near legendary. In fact a study showed that on average, high performers achieve 400% more than the average employee. They don’t even seem to notice the hours go by. You’ll see emails, reports, questions and spreadsheets coming from them until 11pm on weekdays and even on weekends and holidays. Their drive to move forward, improve and get things done always keeps them going. Work like Energizer Bunnies: Remember the old TV commercials featuring the Energizer Bunny that simply keeps going and going? High performers are the same. Not only are they work horses, but their energy and drive seem unending and they consistently deliver day in day out. Their performance isn’t sporadic. It’s consistent. These people are marathon runners. Not sprinters. Crave constructive feedback: High performers are always looking to improve. Getting constant, constructive feedback is a key part of this process. Rather than hearing whey do do well, they’re usually much more focused on getting actionable feedback on where they can improve and what they don’t do so well. According to an article in Harvard Business Review, 50% of high performers say they expect at least a monthly sit down with their managers, but only 53% say their manager delivers on their feedback expectations. Seek to learn outside the organization: Not only do they look for feedback from managers and peers but they’ll even go outside the organization to get tips and insights from others to see what they can use and adapt to be better at their own jobs. The other day I was talking with a woman who I’m considering coaching. When I suggested she reach out and talk with others in different companies who were already doing the role she was new to, she rattled off 3-4 examples of people she had already contacted and told me the insights and suggestions she had already put to work. That’s the sign of a high performer. High performers aren’t afraid to look for help whether it’s from friends, online groups or through coaching or course work. 1. Agree on clear goals and align expectations. I spoke about this in my last post when I talked about managing Tyrant Bosses. With high performers it’s essential to be crystal clear when setting goals. These goals should be agreed by both parties and be as measurable as possible. Use a framework like the SMART framework so you both agree to goals that are specific, measurable, accountable, relevant and time bound. Don’t be afraid to set stretch goals as well since high performers love a challenge but make sure they are also doable since having ambitious goals that are unachievable can rapidly erode motivation and self confidence even among these high-powered folks. 2. Give them the tools to succeed. Your role as manager is to set a strategy, provide the direction and give your people the resources they need to succeed. Make sure your high performers have the tools they need (people, budget, training etc) and remove any obstacles that stand in their way. 3. 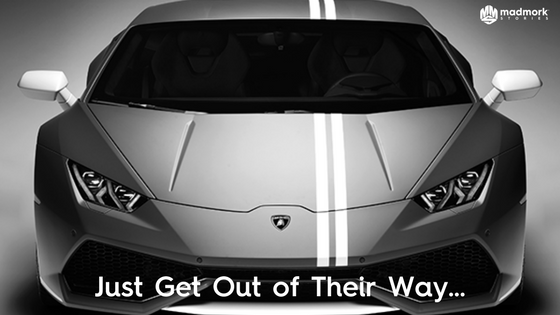 Get out of their way. A previous 30′ something CEO I worked with would sit at my desk and edit some of the presentations and materials I would be working on. He thought since he knew the industry better and I was still ramping up, it would save time and help me. It didn’t (I actually left 4 months later). Once you’ve agreed on goals and given high performers the tools they need: LEAVE. Just get out of their way and let them get on with it. High performers love to have their freedom and the autonomy to get things done in the manner they prefer. If they need help they’ll ask for it. If you micromanage them they’ll get frustrated and things usually go downhill from there. This is particularly true for corporate high performers who join startups. One of the main reasons many of them join early stage companies isn’t so much for the options, it’s for the autonomy to do something in the way in which they’d like to do it. With minimum interference. 4. Use your 1-1’s to maximum impact. High performers are extremely allergic to non-productive meetings. That includes the 1-1’s they have with you! So make sure you have clear agendas laid out for these meetings and focus the meetings on what you can do for them. Avoid using these meetings for reporting since you can do that via email, Slack or over lunch. Your 1-1’s should be about finding out what obstacles they need your help on, whether they need more resources or whether there are important changes which might impact their priorities (see my post on managing Killer 1-1’s). The 1-1 is also a great opportunity to provide constructive feedback on how they are doing (see above). Importantly, you’ll want to establish the cadence of these meetings and make them part of your routine and theirs. Make sure you’re on time and be open to cancelling them as needed (since high performers tend to get incredibly busy). These meetings should also be an opportunity to ensure the high performer is focused on the “right” projects since they may get distracted by other requests or shiny, new interesting projects that pique their interests (see below). 5. Give them special projects. These can be particularly helpful if your current promotional structure doesn’t lend itself to providing them with the career path they would like (at the speed they would like). For example, one of the people on my team at Google was always ahead of his plan and tempted by new and interesting projects. He had worked in emerging markets and had a very entrepreneurial background. So when I realized I might not be able to promote him as quickly as we would want, I gave him a special project to jump start and lead marketing partnerships initiatives with our carrier partners including Verizon and Sprint. It provided new and interesting work for him, gave him the chance to grow and build his network and acted as a release valve so he wouldn’t think so much about where he was or was not career wise. Just make sure these projects don’t distract the high performer too much and also that they contribute to the business in a meaningful way. 6. Provide opportunities for growth. As mentioned previously, growth is like oxygen for high performers so make sure you provide plenty of opportunities to learn. At Course Hero, my head of growth was interested in moving into product marketing. Though we couldn’t accommodate her request in the short term, I encouraged her to take a course in product marketing at General Assembly and provided the budget to do so. This allowed her to continue to focus on some of the core projects I needed her to complete but also kept her motivated about the possibility to move into a new role. She also acquired new skills which she was able to leverage in her next role. Growth can come from online courses, working on part time projects across other teams or even taking a part time course at a local university. A lack of clear growth opportunities can be particularly frustrating for high performers and is often a reason why they look for opportunities elsewhere. 7. A players play with A players. One of the best ways I found to keep my top people motivated was to surround them with other top players. That’s one of the key reasons people stay at companies like Google or Amazon. High performers want to surround themselves with others of the same caliber so they can learn from them and improve the overall success of the team. Importantly, you can further motivate your best people by actually enlisting their help in recruiting and interviewing other great members of your team. This not only get them excited about bringing onboard new talent but also allows them to learn essential skills involved in recruiting and makes them part of the team building process which is fundamental for bonding. It’s a win-win all around. 8. Give them flexibility in ‘how’ they work. This is sometimes a tough one in some companies. Last year, Yahoo! arguably made a disastrous mistake when CEO Marissa Mayer, curtailed the ability of employees to work from home. Independently of whether I’m a fan of Mayer’s or not, your philosophy with high performers should be simple: As long as they deliver and the way they do it doesn’t damage the ability of the team to deliver and doesn’t abuse company policy, you should allow it. In my case, I’ve often had people on my team who struggle with 1 1/2 hour commutes. There are some days where they’d like to just save themselves the 3 hours and work from home. I’ve always been cool with it and they’ve never abused it. If you have to worry about them working from home and getting things done or abusing the rules then it’s also quite simple: You’re not managing high performers. Give your high performers some flexibility. You’ll reap the benefits. 9. Encourage them to decompress. These people are like high performance sports cars. They’ll drive at 12,000 RPM as long as possible until they’re out of gas. The problem is that some of them will often blow the engine as a result (and burnout). As a manager you need to stay on top of how they’re feeling both physically and psychologically. Having one of them burn out is bad for them but also magnifies the workload on the rest of the team who have to pick up the slack. It’s important to pressure them to take time off and also do activities that help them let off steam and vent. You can also do your share by avoiding sending them emails late at night, on weekends and during holidays (which they’ll read if you do!). Doing team activities like volleyball, field trips and other activities which help them get outdoors and get some exercise can also go a long way to help them stay fit and happy. 10. Work to plot a path for career advancement. This is particularly important in startups and small companies where hours are long and work is intense. High performers are willing to put in the time and even more energy than most but they’re also often more demanding and more ambitious. In previous roles I would do 1-1 meetings 4 times a month and use one of those 1-1’s as a ‘walk and talk’ meeting. During those walk and talk’s I would often discuss developmental issues and career direction. With high performers it’s important to discuss these topics more often than with others but also to clearly plot a course for them with tangible, agreed upon metrics which they need to hit to move forward. Always ensure, however, that these metrics and the end goal advancement are in full alignment with your HR policies and that you have support internally when it comes time for promotion. The war for talent has never been more brutal than it is today. Finding and hiring great people is tough but keeping those people is even tougher. You owe it to yourself, your company and your team to do whatever is in your power to keep your best people focused and happy. Hopefully, some of the tips above will make that process just a little bit easier. I hope you enjoyed this post and feel free to like, comment and share as needed. Are there tips that have worked well for you? Are there situations which you find challenging when managing high performers? Feel free to share.